Lithium Battery Pack 36V nominal, 42V peak Capacity = 7.5 AH Max Current = 25A Uses Samsung 25R cells in 3x10 matrix. Includes basic 2A charger. Lithium Battery Pack 36V nominal, 42V peak Capacity = 9 AH Max Current = 30A Uses Samsung 30Q cells in 3x10 matrix. Includes basic 2A charger. Lithium Battery Pack 48V nominal, 52V peak 13-S 9 AH Optional 2A charger. 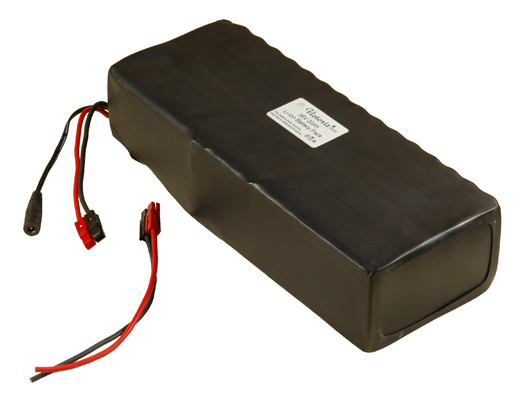 Lithium Battery Pack 48V nominal, 52V peak 13-S 12 AH Optional 2A charger. Lithium Battery Pack 36V nominal, 42V peak Capacity = 15 AH Max Current = 35A Uses Samsung 30Q cells in 5x10 matrix. Includes basic 2A charger.